Sarsaparilla (Smilax Officinalis) is primary used to treat skin disorders, liver problems, rheumatism, hormone excesses, syphilis, gout, venereal diseases, and rheumatoid arthritis, also aids in testosterone activity in the body. Men suffering from weakened, unsustainable erections may benefit from “Boost Your Erectile Capacity” as it is know to help improve testosterone levels while increasing energy levels. Read more at about Sarsaparilla Jamaican at Herballove. As a dietary supplement, 1-2 ml. (approx. 28-56 drops), 2-3 times a day. Shake well. 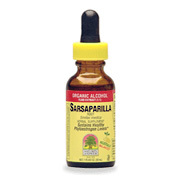 Sarsaparilla root fluid extract (1:1) 2,000mg, 12-15% certified organic alcohol. Sarsaparilla Root Extract is shipped in a discrete, unmarked package. Orders are processed immediately and usually take about 3 to 5 working days to be received. We do ask that you try it for 2 to 3 weeks to feel the full effects. Any information received is used only for order processing and shipping purposes. Your information, such as e-mail address, will never be disclosed to a third party.